As a YL teacher, I think we tend to neglect the communicative needs of our kids. As a YL teacher, I think we tend to neglect the communicative needs of our kids. Coursebooks tend to assume a lot about Young Learners, but quite often I find that the language and topics covered in coursebooks do not meet the communicative needs of my learners. In the past year I’ve been experimenting with different ways of addressing this problem. For instance, before starting a unit in a coursebook, I like to assess what my students already know about the topic and try to discover what they want to learn. This enables me to adjust the coursebook unit to meet their needs. Here’s an example of a lesson to introduce a unit on “House” to a group of 6-7 year olds. 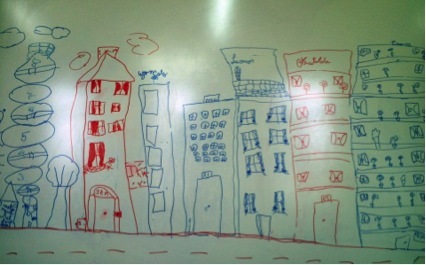 I tell students to imagine they all live on the same street and I get them to draw their houses on the board. Depending on number of students, I either get them to come up at the same time to draw their houses, or bring them up in groups. If you have a large group, you can use mini-whiteboards (A3 size), which you can make yourself. I like having them draw at the same time because they learn how to share space, which helps with community building in the classroom. Once their “neighbourhood” is complete, each child then comes up to the board and, with teacher support, describe their house to the rest of the group – It’s big/small; I live in a flat/house; colours; house number etc. We find out a lot about each other’s houses and, by the time we move onto the coursebook, I have a clear idea of how I can use the coursebook to help them talk about the things that are important to them. We should always bear in mind that we teach the learner and not the coursebook. Assessing what students want to know about a topic is extremely useful in helping us find ways to adapt the coursebook to meet our learners’ needs.